Have you noticed the slow trend of the older jazz festivals to add new genres to their lineups, especially the trad fests? Perhaps the closing of some festivals because of smaller crowds has caused these changes. Then, again, some of the “older” festival boards have been getting a bit younger. It’ll be interesting to see how they fare with their changes. My 29-year experience with the Elkhart Jazz Festival began with a commitment to mixed genres or an eclectic lineup. And, instead of dropping some of them, we have added genres—and it’s paid off with good crowds and a money-making festival. We used consultants (Penny Tyler of Chicago fest, Eddie Banjura of Illiana, and Don Boyer, a professional festival attendee) to plan the first festival in 1988 and that really paid off. They readily agreed with us that the fest should not restrict the genres. We still believe that was our best decision. Penny Tyler urged us to treat the musicians as artists who deserve first class treatment and we have. She covered the legal matters that could haunt us if we ignored them, especially copyright laws as well as the chances of injury. It’s worth a few dollars of insurance for “just in case.” Having good talent, she said, is expected but lodging and transportation are also critical. 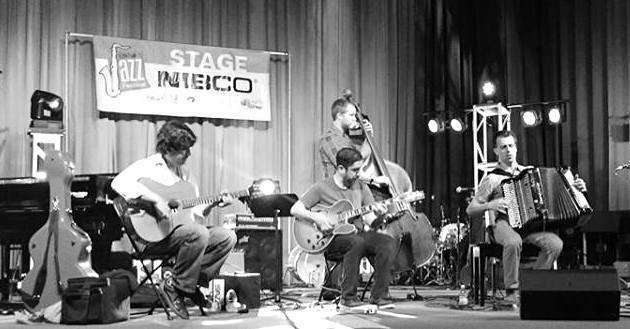 The Hot Club of Detroit swing hot gypsy jazz on the stage at the Elkhart Jazz Fest in June 2015. Eddie Banjura suggested we use the downtown area for the festival and that’s where it’s been since. For the first several years we used a motel in the center of town where the musicians and a lot of fans stayed. It provided three venues, with a free venue on nearby Main Street. Three other venues were within a block or two. We still have from six to eight venues on Main Street or very close to it. Our music began with New Orleans and Dixieland jazz along with swing and bebop along with some “light” contemporary. We soon added Latin jazz and fusion and both do draw well. More recently we’ve used gypsy jazz and that also caught on in a hurry! We include military jazz groups like the Airmen of Note, the Commodores, and the Ambassadors every year. For over a fourth of our lineup uses regional talent from a 100 mile radius which includes Illinois, Wisconsin, Ohio, and Michigan. First class talent calls for first class lighting and sound. I’m sure there’s no argument there and, yes, it is costly but the musicians and the crowds really appreciate it. Don Boyer indicated that the easiest way to lose your crowd is with bad sound and lighting! I also suggested that the venues all be within walking distance and that we must consider the effect of bad weather. Our first fest was conducted in 100 degree plus weather all three days and our outdoor venues suffered some but today we have only one outdoor venue, the free stage on Main. All of our patrons can park with a short walk to the venues. And there is no shortage of fine downtown restaurants; however, we do have several fast-food tents set up near the free stage as well as a beer tent. In ’88 we had close to 5000 people attending and nearly half of that was paid attendees. The free stage area can hold over two thousand and often does; however we’ve gone from 5000 to 15,000 in the last several years. At first we used only the regional talent and the military band, as well as a church choir on Sundays on the free stage but we’ve found large crowds are also created when we use from six to eight high school bands on Saturday. More recently we also have a two day workshop for high school jazz students and some of them play with their all-star faculty. We now have two free stages on Main Street, all a couple of blocks from one another. We use a little non-jazz talent on the original free stage, including blues, folks, and bluegrass. Another stage, sponsored by downtown businesses, has rock on Friday night and jazz on Saturday. As a result, we have more dark-haired folks downtown than gray-heads—and that’s good. What else helps? Being in Elkhart with its many musical instrument companies and a lot of folks and businesses who take pride in sponsoring the festival. For the past few years, we’ve used “big names” at our main venue, the Lerner, including bands like Wynton Marsalis’, the Big Bad Voodoo Daddy, Preservation Hall band, John Pizzarelli, and Bria Skonberg. Having two FM radio stations playing jazz also helps! When I first considered writing about Elkhart’s festival, I made a list of what I thought helped most and I came up with a list of 25 ideas. In other words, there are many thing to consider in putting on a festival. I’ll keep my eye on The Syncopated Times to see if any of the other festivals are willing to share what’s going on with theirs. We can learn a lot from sharing—that’s for sure! Van Young has helped keep the Elkhart Jazz Festival a swinging proposition for the past three decades. He also hosts Patterns in Jazz, Sundays at noon (Central) at WGCS-FM 91.1, Goshen, IN. Listen online at www.globeradio.org.